Custom Dashboards help you tell your data story with a rich, flexible set of report creation tools. Settle in, and let's get going! Please note: Your existing Favorites dashboards have migrated into Custom Dashboards. You can continue to access them there. Also, all of your scheduled reports of your Favorites dashboards have moved to the new Custom Dashboards as well. A custom dashboard is a collection of charts, graphs, tables, and lists that you can create and customize in your account. You can create multiple custom dashboards in your account. Open the Custom Dashboards section in the side navigation, and create a new dashboard by clicking New Dashboard. Choose to start from a pre-existing template or a blank template. Starting from a pre-existing template can help you get started quickly - just swap metrics and chart types for ones that fit your needs. There is a wide variety of chart types you can include in your custom dashboards. Bar / Stacked Bar. Choose a single metric, and the chart will display one bar per company on that metric, sorted from biggest to smallest. Bar / Stacked Bar with % change. Choose a single metric, and the chart will display one bar per company on that metric, sorted from biggest to smallest. The bar will also be annotated with a secondary label displaying the relative change for that metric against the currently selected compare period. Pie Chart. Choose a single metric, and the chart will display a pie chart with one slice per company, sized by the value of the chosen metric. Time Series. Choose a single metric, and the chart will display one line per company on that metric. Here, you can choose the time grouping as day, week, or month. 2D-Chart. Choose two metrics, and the chart will display one dot per company with the X-axis position determined by the value of metric one, and the Y-axis determined by the value of metric two. Table. Choose one or more metrics, and the table will display one row per company, with the columns displaying the metric values. The last metric in the table will be the default sort and includes an inline sparkbar. Focus Company Table. Choose one or more metrics, and the table will display one row per metric, with the columns displaying data for the currently selected focus company. The specific columns are: the current metric value, the relative change to the compare time period, the metric value from the compare time period, and the absolute change from the previous time period. 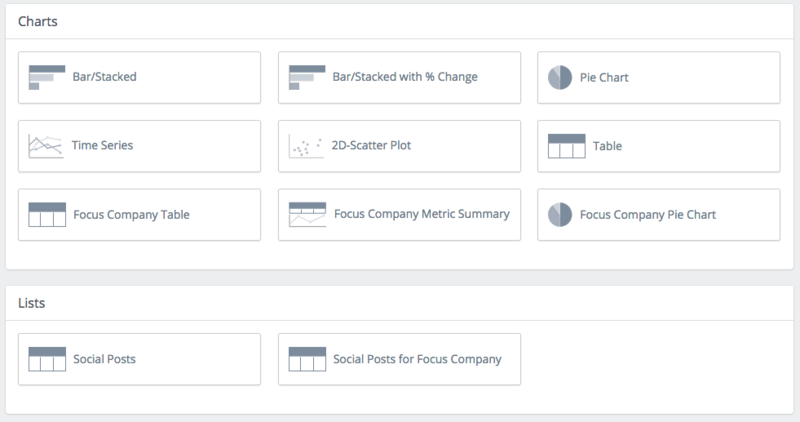 Focus Company Metric Summary. Choose one metric, and we'll display a custom chart that highlights the current and relative change values for the focus company's performance on selected metric. The bottom portion of the chart shows the daily time-series data for that metric. Focus Company Pie Chart. 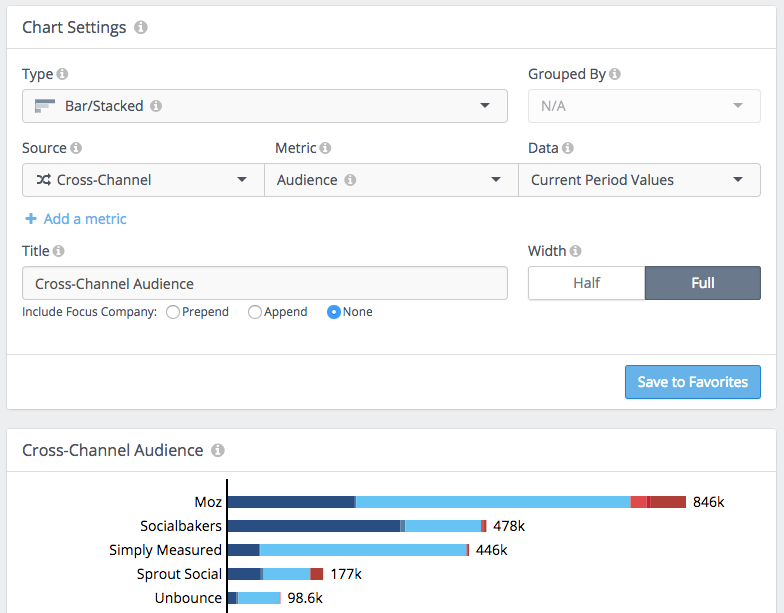 Choose one metric for which we have breakdown information (e.g., Cross-channel metrics breakdown into channels, engagement metrics breakdown into specific engagement types), and we'll display a pie chart with one slice per type. The data shown is for the currently selected focus company. Social Posts. This list displays social posts in a rich table, with one post per row. You configure the relevant metrics to view for each post. The default sort is the first metric in the table, from biggest to smallest. This table includes posts from all companies in the currently selected tag filter are included. Social Posts for Focus Company. This list displays social posts in a rich table, with one post per row. You configure the relevant metrics to view for each post. The default sort is the first metric in the table, from biggest to smallest. This table only includes posts from the currently selected focus company. Once you've chosen a chart type to create or edit, you have many controls to customize your view of the data. Please note that not every control is applicable to every chart type. For convenience, you can also switch chart types in this settings interface. As you add and remove metrics from your view, different chart types may not be available to you. For example, if you have added two metrics to your configuration, a bar chart is not available. Similarly, a 2D-chart is only available when you have configured exactly two metrics. 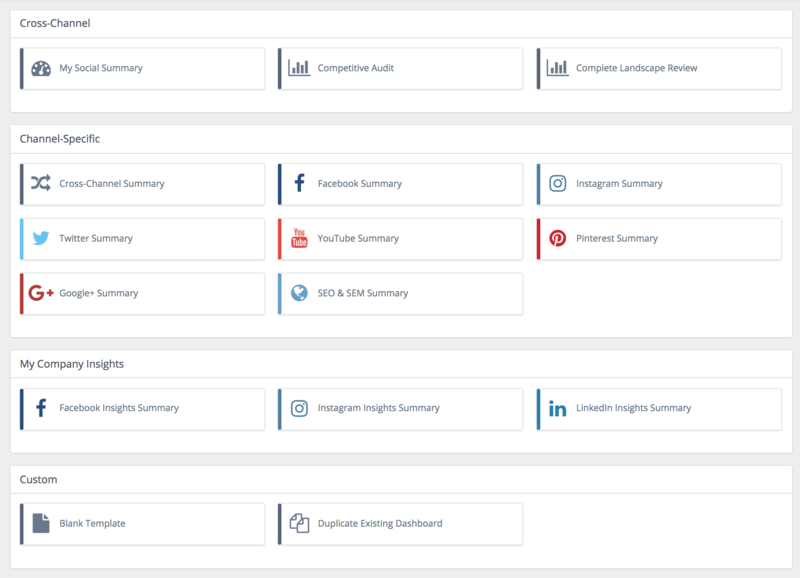 When choosing metrics, you have full access to the broad array of social and SEO metrics that are available in Rival IQ. You can also choose to work with the current period values, previous period values, absolute change, and relative change values. Please note that not all data is available in all chart types. 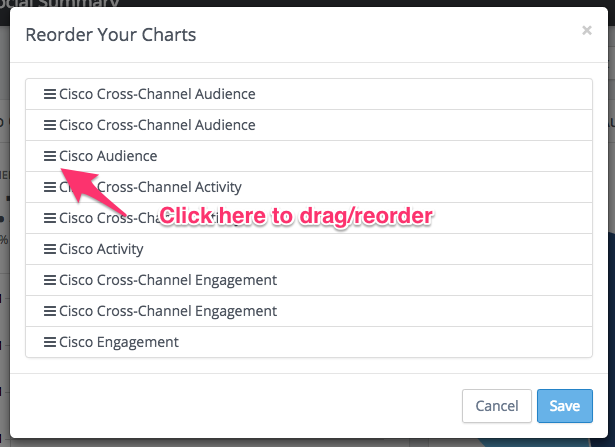 You can customize the title for each chart that you add to your dashboard. If you're creating a chart about the focus company, and you want to use the focus company name in the title, feel free to do so. If you are building a dashboard with account-wide visibility, you should use the prepend, append title functionality to have our system place the correct company name in the title as you move among landscapes. If you are editing a chart, you have an option to save your updates to the existing chart or to save the updates to a new chart. Pro tip: If you're trying to quickly build a chart that is similar to an existing chart, edit the existing chart, make your updates, and save as new. You'll love how fast this is! Now that you've got the basics, let's have a look at some other work you might want to do. To reorder charts, use the Reorder Charts button in the upper-right hand side of the page. It will present you a list that you can use to drag and drop charts into the order you desire. To access the dashboard edit functionality, use the Edit button in the upper-right hand side of the screen. There, you'll find the ability to rename a dashboard or to change the visibility of dashboard between Account and Landscape. Landscape dashboards are only visible in the landscape within which they were created. Account dashboards are visible in any landscape within your account. To delete a dashboard, you'll also use the Edit button described in the previous section. Look for the delete button in the lower-left hand side of the edit screen.